Resides in San Pedro de Macoris, DR in the offseason with his wife, Andreina...Participates in the Tigers Dreams Come True program; supports the Gloves for Kids program; attended Keeping Kids in the Game; participated in Play Ball Weekend pregame activities, ¡Fiesta Tigres! "Dia en el Parque", the pregame ceremony prior to the annual ¡Fiesta Tigres! game, the Tigers Winter Caravan and TigerFest. Completed his first full season in the Majors in 2018, playing in 144 games with Detroit...Hit the first four leadoff home runs of his Major League career in 2018…belted leadoff homers on June 2 vs. Toronto, August 30 at New York (AL), September 5 at Chicago (AL) and September 14 at Cleveland...Knocked a pair of walk-off homers during the season, hitting game-ending home runs on June 9 vs. Cleveland and September 7 vs. St. Louis...Recorded his first career four-hit game on April 19 vs. Baltimore, going 4x4 with a home run and three RBI. ...Sidelined from May 13-25 with left wrist tendinitis...Posted his first career multi-homer game on May 26 vs. Chicago (AL)...Reached base safely in 28 consecutive games from April 21-June 3, hitting .283/.392/.557 with 24 runs scored, nine doubles, one triple, six home runs and 17 RBI during the streak...Hit .291/.356/.486 with 11 doubles, six home runs and 21 RBI vs. lefthanded pitchers, while he batted .199/.303/.358 with 17 doubles, three triples, 13 home runs and 33 RBI against righties. Began the 2017 season in the Chicago Cubs organization, before being acquired by the Tigers on July 31...Was a perfect 4x4 with three doubles, a triple and five RBI on April 12 vs. New Orleans...Played in 21 games during April with Triple A Iowa, hitting .306 (22x72) with 15 runs scored, 10 doubles, two triples, three home runs and 18 RBI...Hit the first home run of his Major League career on June 29 at Washington... also homered with the Tigers on September 14 and 17 vs. Chicago (AL)...Reached base safely in 23-of-27 games with the Tigers and had a .406 on-base percentage...Made his Tigers debut on August 8 at Pittsburgh and went 1x2 with a run scored...Drove in two runs September 5 vs. Kansas City…marked his first RBI as a Tiger...Started a 5-4-3 triple play on September 8 at Toronto...was the Tigers first triple play since August 1, 2001... Established a career high with four RBI on September 17 vs. Chicago (AL).. .Finished the month of September with a .341 (30x88) batting average with 15 runs scored, seven doubles, two home runs and 13 RBI...Appeared in 22 games with Toros del Este in the Dominican Winter League, hitting .289 (24x83) with 10 runs scored, four doubles, one triple, one home run and eight RBI. Jeimer split the minor league season between Double-A Tennessee and Triple-A Iowa, and also made his major league debut with the Cubs in July ... went 1-for-11 with two walks and a hit-by-pitch in five games with the Cubs from July 3-7 ... Recalled from Triple-A Iowa and made his major league debut, July 3 at the Mets ... collected his first hit, a single, off Noah Syndergaard in the seventh inning ... reached base in each of his first three contests ... was sent back down to Triple-A, July 8 ... Began his season at Double-A Tennessee, batting .219 (46-for-210) with 17 doubles and four homers in 56 games ... named a mid-season All-Star by the Southern League, his second-straight season with an All-Star selection ... Was promoted to Triple-A Iowa, June 8, his first appearance at the Triple-A level ... excelled with the I-Cubs, batting .333 (88-for-264) with 22 doubles and nine homers in 76 games ... A switch-hitter, Jeimer batted .351 (27-for-77) vs. left-handed pitchers and .326 (61-for-187) vs. right-handed pitchers with Iowa ... Selected to the 2016 SiriusXM Futures Game in San Diego, but was unable to play after being promoted to the majors prior to the contest. Jeimer Candelario earned Carolina League All-Star honors and his first promotion to the Double-A level as he combined to hit .277 (132-for-476) with 35 doubles and 10 homers in 128 contests between Class A Myrtle Beach and Double-A Tennessee. Began the season with Myrtle Beach, batting .270 (86-for-318) with 25 doubles, three triples, five homers and 39 RBI in 82 games. July 4 at Carolina, went 4-for-6 with two singles, a double and triple, three RBI and three runs scored ... his four hits tied a career-high. In 57 games in the season's first half, he batted .273 (59-for-216) with 16 doubles, five homers and 27 runs scored to earn his first minor league All-Star selection. Placed on the seven-day disabled list, June 8, with a left hand bruise ... was reinstated, June 15. © Was promoted to Tennessee, July 21, marking his first stint at the Double-A level ... played in 46 games with the Smokies, posting a .291 average (46- for-158) with 10 doubles, one triple, five homers and 25 RBI. Recorded an eight-game hitting streak, July 24-August 1 (.400/12-for-30) ... drove in seven runs during the span. Jeimer split the season between Single-A Daytona and Single-A Kane County, batting a combined .223 (103-for-462) with 29 doubles, five triples and 11 home runs ... Earned Midwest League Player of the Week honors from July 7-13 after batting .476 with four runs scored and five doubles ... Was named the Cubs eighth-best prospect by Baseball America entering the season ... Began the season at Daytona, hitting .193 (42-for-218) with 10 doubles and five homers in 62 games ... was transferred to Kane County in mid-June and went on to hit .250 (61-for-244) with 19 doubles and six homers in 63 games. Jeimer appeared in a career-high 130 games with Single-A Kane County in the Midwest League ... hit .256 (128-for-500) with 35 doubles and a career-high tying 11 home runs ... His 35 doubles ranked third in the Midwest League and tied for sixth on the Cougars' all-time single-season list ... Batted .274 (32-for-117) against lefties and .251 (96-for-383) against righties ... Posted a .282 average (42-for-149) with 11 doubles and two homers with runners in scoring position. Jeimer spent the entire season with the Boise Hawks in the Northwest League ... batted .281 (78-for-278) with 14 doubles, six homers and 47 RBI in 71 games ... Batted .388 (26-for-67) against southpaws compared to .246 (52-for- 211) against righties ... Collected a season-high four hits and three runs scored August 10 at Everett, going 4-for-5 with two doubles and two RBI ... Began the campaign batting .339 (20-for-59) in 15 June contests. Jeimer made his professional debut with the Dominican Summer League Cubs, appearing in 72 games ... Batted .337 (84-for-249) with 16 doubles, two triples, five homers and 53 RBI ... drew 50 walks leading to a .443 OBP ... Drove in a season-high four runs, August 15 vs. the DSL Phillies, going 3-for-6 with a double, triple and home run. 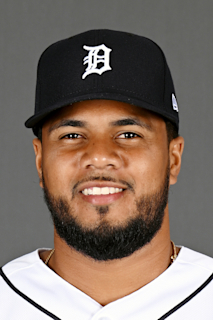 May 25, 2018 Detroit Tigers activated 3B Jeimer Candelario from the 10-day injured list. May 23, 2018 Detroit Tigers sent 3B Jeimer Candelario on a rehab assignment to Toledo Mud Hens. December 26, 2017 3B Jeimer Candelario assigned to Tigres del Licey. November 14, 2017 3B Jeimer Candelario assigned to Toros del Este. September 2, 2017 Detroit Tigers recalled 3B Jeimer Candelario from Toledo Mud Hens. August 9, 2017 Detroit Tigers optioned 3B Jeimer Candelario to Toledo Mud Hens. August 7, 2017 Detroit Tigers recalled Jeimer Candelario from Toledo Mud Hens. July 31, 2017 Detroit Tigers optioned 3B Jeimer Candelario to Toledo Mud Hens. July 4, 2017 Chicago Cubs optioned 3B Jeimer Candelario to Iowa Cubs. June 26, 2017 Chicago Cubs recalled Jeimer Candelario from Iowa Cubs. May 17, 2017 Chicago Cubs optioned 3B Jeimer Candelario to Iowa Cubs. May 9, 2017 Chicago Cubs recalled Jeimer Candelario from Iowa Cubs. March 23, 2017 Chicago Cubs optioned 3B Jeimer Candelario to Iowa Cubs. November 3, 2016 Jeimer Candelario roster status changed by Chicago Cubs. October 7, 2016 Chicago Cubs reassigned 3B Jeimer Candelario to the minor leagues. October 3, 2016 Chicago Cubs recalled 3B Jeimer Candelario from Iowa Cubs. July 9, 2016 Chicago Cubs optioned 3B Jeimer Candelario to Iowa Cubs. July 3, 2016 Chicago Cubs recalled Jeimer Candelario from Iowa Cubs. June 8, 2016 3B Jeimer Candelario assigned to Iowa Cubs from Tennessee Smokies. March 18, 2016 Chicago Cubs optioned 3B Jeimer Candelario to Tennessee Smokies. November 20, 2015 Chicago Cubs selected the contract of Jeimer Candelario from Tennessee Smokies. July 21, 2015 3B Jeimer Candelario assigned to Tennessee Smokies from Myrtle Beach Pelicans. June 15, 2015 Myrtle Beach Pelicans activated 3B Jeimer Candelario from the 7-day disabled list. June 10, 2015 Myrtle Beach Pelicans placed 3B Jeimer Candelario on the 7-day disabled list retroactive to June 6, 2015. April 6, 2015 3B Jeimer Candelario assigned to Myrtle Beach Pelicans from South Bend Cubs. March 5, 2015 3B Jeimer Candelario assigned to Chicago Cubs. December 20, 2014 3B Jeimer Candelario assigned to Toros del Este. June 19, 2014 Jeimer Candelario assigned to Kane County Cougars from Daytona Cubs. March 30, 2014 3B Jeimer Candelario assigned to Daytona Cubs from Kane County Cougars. March 7, 2014 3B Jeimer Candelario assigned to Chicago Cubs. October 18, 2013 3B Jeimer Candelario assigned to Aguilas Cibaenas. April 1, 2013 3B Jeimer Candelario assigned to Kane County Cougars from Boise Hawks. March 26, 2013 3B Jeimer Candelario assigned to Chicago Cubs. June 12, 2012 Jeimer Candelario assigned to Boise Hawks. April 3, 2012 3B Jeimer Candelario assigned to Chicago Cubs. May 28, 2011 3B Jeimer Candelario assigned to DSL Cubs2. February 27, 2011 3B Jeimer Candelario assigned to DSL Cubs1. November 20, 2010 Chicago Cubs signed free agent 3B Jeimer Candelario to a minor league contract.